Want to go watch the Springboks first rugby test in Durban on the 20th June (against the British & Irish Lions)? Here's a list of the cheapest flight prices after lunch on the afternoon of the 19th June - as you can see, much higher than your usual prices from Cape Town to Durban, but Mango is still offering a one-way ticket for R989 (and SA Roadlink a coach bus for R299). *one-way, including tax, leaving CPT between 1344 & 2031 on the 19th June 2009. Larch caught a flight from Johannesburg to Cape Town to attend the end of year function of Orange Street Software. 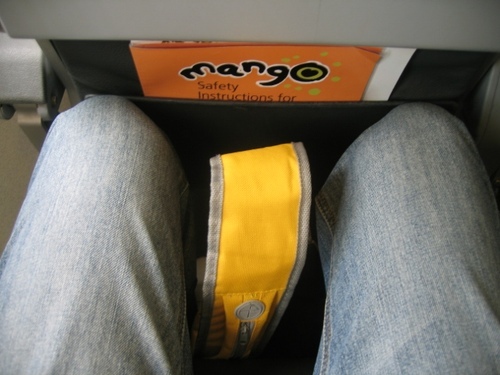 He flew with Mango Airlines, and took this awesome picture which demonstrates just how little legspace Mango offer (although for some the lower price will make up for this, and if you sit at the emergency exit or the front row you'll get much more space). He didn't have many complimentary things to say about the price of the refreshments aboard the flight (e.g. R10 for a cup of coffee). In Cape Town he rented a Ford Focus, which he flagged as giving a bumpy drive. A highlight of the trip for him was attending the Obz festival - a street party (apparently not common in Pretoria/Johannesburg). He also mentioned that Cape Town International Airport is "light years" behind Johannesburg O.R. Tambo International Airport in terms of service and quality.